SpinMaid Reviews - Is it a Scam or Legit? SpinMaid uses dual spinning heads and interchangeable pads to gently clean as well as a professional service, but without the hassle or the high price. SpinMaid is a cordless, rechargeable, 5-in-1 floor scrubber that features dual spinning heads to draw out dirt and evenly polish while it effortlessly hovers over your flooring. How? Each of SpinMaid’s washable cleaning pads use “professional spinning technology” to deep clean and polish with ease, but using gentle, slow speeds that can be effectively used on just about any flooring surface. And because you won’t have to apply a lot of force, SpinMaid is ideal for those with arthritis, while its battery will last an hour—plenty of time to clean your whole home. This means that SpinMaid can provide similar benefits as a professional machine, but at an affordable price. No more worrying about dirty mops, expensive professional cleaning services, fussing with replacing batteries, or handling disposable refills! How’d you like a professional floor cleaning at a fraction of the price of hiring a company? And you get to own the device and use it over and over again? Seems like a no-brainer! Before you enter your credit card information for SpinMaid, we think there are some important factors you should consider—perhaps most importantly, whether or not you can expect it to clean and shine like a professional machine. But before getting to that, let’s take a closer look at SpinMaid’s pads. What Kinds of Pads Does SpinMaid Come With? Blue Scruffer Pads – This is similar to what a professional company would use for deep cleaning, making it ideal for stone, tile, and marble. In fact, SpinMaid can even be used on tough-to-clean grout! Green Microfiber Pads – Also used primarily for cleaning, but lighter than the scruffer pad. A better choice for cleaning wood or laminate floors. Yellow Sponge Eraser Pads – Regardless of the surface you’re cleaning, SpinMaid’s sponge pads can lightly clean them, without leaving behind light scratches or getting rid of your shine. With this out on the table, how well can you really expect these pads to clean your floors? Will they approach anything like a professional service? 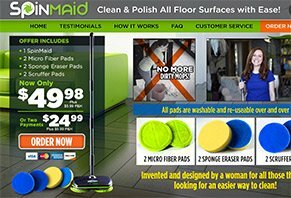 How Effectively Will SpinMaid Clean Your Floors? Most professional hard flooring cleaners feature high-torque motors that spin 15”-20” pads up to 200 rotations per minute (RPM). These cleaners are also fairly heavy (usually in the 100 pound range), which increases downward pressure without using your bodyweight, providing an even more effective cleaning. Considering their power though, if guided by a competent professional, they can provide a great clean that doesn’t damage your flooring. On the other hand, we have SpinMaid, a lightweight device, that by the company’s own admission, is a “gentle, slow-speed machine.” In fact, judging by SpinMaid’s commercial, it appears that each of the two pads rotate about once per second, or 60 RPM—much slower than a professional machine. And because there’s not much downward pressure, this will require you to push down in order to pick up persistent dirt and grime. So, when it comes down to it, you don’t have fast-spinning heads, powerful motors, or necessarily ease of use, which seems to be the precise opposite of a professional machine in just about every feasible aspect. Now, we’re definitely not trying to come down too hard on SpinMaid, but this isn’t our only concern. Is SpinMaid Ideal For Those With Arthritis? If you’re strongly considering SpinMaid because of its ease of use (especially if you suffer from arthritis or other kinds of joint pain), we already talked about how the extra downward pressure needed might not be ideal. But another possible downfall with SpinMaid is that it doesn’t automatically dispense any cleaning formula, so you’ll have to use the attached spray bottle (remember this, because we’ll come back to it in a second). Now, if you’re just cleaning your kitchen, this might not be too big of a deal. But if you have to spray most of the flooring in your home in order to use SpinMaid, how easy do you think it’d be? And if you have arthritis, how much pain do you think you’d be in? How Long Will SpinMaid’s Pads Last? According to the company, SpinMaid’s pads are reusable and will last a long time. But we noticed that these pads are attached using Velcro on the bottom of each spinner, and we have to wonder—after they become exposed to water, dirt, and grime—how well they’d continue to stick. What Kind of Battery Does SpinMaid Use? Finally, the manufacturer claims that SpinMaid features a rechargeable battery, but it doesn’t appear to be replaceable. We also don’t know what kind of battery it contains, or how long you can reasonably expect it to last (i.e. how many recharge cycles it can go through before no longer holding a charge). Based on the reputation of many ASOTV products, it might be the case that SpinMaid’s battery isn’t high quality, and might not last as long as you’d like. How Much Does SpinMaid Cost? Note: The website claims that you can also purchase 2 additional shag pads and one bottle and holster, but it wasn’t available when we attempted to check out. All SpinMaid purchases come with a 30-day refund policy, less S&H charges. In order to request one, you’ll need to call customer service at 844-296-2197. Will SpinMaid Have Your Head Spinning? Given all of this, we think that SpinMaid might work about as well as stick mop-type devices with replaceable wet pads (similar to the well known Swiffer). In other words, since SpinMaid’s heads spin very slowly, most of the cleaning will come from the back-and-forth motion provided by you, versus the spinning of its heads. But when you consider that you’ll have to spray on floor cleaner yourself (instead of using a pre-wetted pad), SpinMaid might not provide as much value as stick mops. In either instance though, we definitely don’t think SpinMaid will clean anywhere near as well as a professional service. And with its ultra-high, non-refundable S&H charges, you might lose out on a lot of money just giving it a try. As such, we’d recommend checking out local retailers for better options before placing your order. I have placed my order and have not received anything back, but it did deduct money out of my account. And the number I called is not a working number, and I don't know the status of my order or if I'm getting it in time for Christmas. This is very sad because I ordered this for my daughter and now this. I even expedited my order and paid $10.00 extra. Today I received the SpinMaid scrubber for floors and am disappointed in the tattered packing. The box looks like a puppy has chewed the corners and words are faded as if it had been wet. I have tried contacting the company using the two addresses provided. Emails are returned with "no such address." I have not opened the tacky box yet. Will not order again. I ordered in June, and it took until August 5th to receive it. Is this a scam? Does the product exist? I ordered, paid, and never received it. Is this a scam? It has been months, and I want the product, but I think it is a scam. I tried calling customer service but got a dead phone, no email or legitimate website except a site to order and pay. It is time to report this company. This has not been a pleasant experience. I have ordered this product twice, and both times the order number was conveniently not located. The second order was on 2/26/2017. I called 1-800-761-9056 on 4/8/2017 at approximately 7:30 am and received a recording that the number is no longer in service. This telephone number worked great when I submitted the order. It is very disappointing that a business claims to be for the product and the customer. From my experience, it is a scam. It would be nice to be proven wrong, but so far the actions of the SpinMaid product personnel is far from honorable. It is a shame; the product views appeared to be the answer to cleaning floors. Just received our SpinMaid this week and after using this product once, we knew we would be shipping it back. Besides being extremely cheaply made it doesn't do anything nearly as good as they try to tell you it does. Like many others, we too have purchased several other types of floor cleaning products, such as the battery operated stick mops with the disposable pads, as well as the more expensive ones with the reusable pads, and this product is by far the worst. Please, do yourselves a favor and do not waste your time and money purchasing this product. I can assure you that any good reviews of this product are written by people that work for the SpinMaid company or have some other sort of financial gain by writing good reviews. I have used the SpinMaid and it really is great! I was one of the first people to get a SpinMaid, and I can tell you that I clean houses for a living. I know I was one of the first because I talked to the company and they told me. I have always used either a micro fiber mop or an old style mop, and therefore thought the SpinMaid wouldn't work. But WOW, it does. Your comments saying that you have to push hard are so wrong. Also, the battery does last a long time, not long enough for me to take it to customer's houses, but its so easy to use, and you don't even have to push it. You cannot compare it to a Swiffer or another silly item like that, it's so different, even better then the Wet Jet. It cleans very well, I am so surprised and happy! Write a Review for SpinMaid!